John Sherman was appointed Secretary of State in President William McKinley’s Cabinet, a position in which he served from March 6, 1897, until April 27, 1898. Sherman resigned his position days after the outbreak of the Spanish-American War. Sherman was born in Lancaster, Ohio in 1823 to a family with a long tradition of public service. Upon his father’s untimely death, Sherman and his 10 siblings, including older brother William Tecumseh Sherman, were raised by various relatives and friends. Sherman briefly followed an interest in civil engineering and surveying before studying law under his uncle, a judge. He was admitted to the Ohio bar in 1844. A decade later, Sherman was elected to the U.S. House of Representatives. An active member of the Republican Party, Sherman was elected U.S. Senator representing Ohio in 1860 and served until 1877. That year, he was nominated to President Hayes’ Cabinet as Secretary of the Treasury. During this time, he helped author the Sherman Antitrust Act to limit monopolies. At the end of the Hayes administration, Sherman returned to the Senate to serve another 16 years. While in the Senate, he ran unsuccessfully for the Republican presidential nomination three times. In 1897, President McKinley selected Sherman to serve as his Secretary of State. Sherman’s tenure as Secretary of State was marked by the tension between him, President McKinley, and Assistant Secretary of State William R. Day. Sherman had been offered the position largely to free up a Senate seat for Mark Hanna, a supporter and friend of the President. Unfortunately for the President, Sherman often diverged from the President’s foreign policy agenda and became increasingly vocal in his criticism of the McKinley administration. 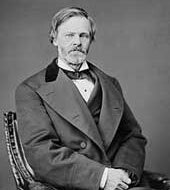 As a result, the President and other members of the Cabinet soon ostracized Secretary of State Sherman, allowing Sherman’s subordinates to negotiate many foreign policy decisions. Relations between Sherman and the McKinley administration became so tense that Assistant Secretary Day often replaced Sherman at Cabinet meetings, an obvious affront to the Secretary. Day negotiated the annexation of Hawaii, as well as U.S. policy towards Spain as the two nations were on the brink of war. Sherman did wield influence when it came to upholding the U.S. interpretation of most-favored-nation treatment in matters relating to international trade. He also worked to secure U.S. commercial concessions in China; many of his policies would become part of the Open Door Policy at the turn of the century. Despite his influence on issues of international commerce, Sherman’s weak position in the Cabinet meant that he was unable to press his opposition to U.S. acquisition of Cuba and his objection to war with Spain. Sherman finally resigned in protest four days into the Spanish-American War in 1898. His bitterness toward President McKinley and his administration continued until his death in 1900.